The wife of motorcyclist Yudashram Dookhie, who was killed in Thursday night’s horrific crash on Vlissengen Road, is refuting claims that her husband rode into a truck. The woman has formed her belief after examining her husband’s motorcycle. According to the woman the motorcycle headlight was “untouched”. 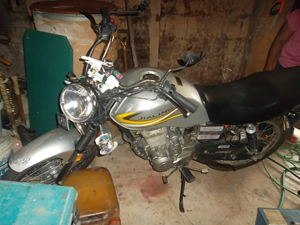 When Kaieteur News examined the motorcycle, which the now dead, Yudashram Dookhie called ‘Andy’ was riding, it was observed that the front of the bike sustained little damage, while the back was badly smashed. “Just one side of the handle was damaged a little bit,” the highly depressed wife, Debbie claimed. “If he de collide with the truck, there would have been bruises to his skin and to the bike but there was no scrapes and no bruises,” the wife claimed. She said the only injury her husband received was the gaping wound at the back of his head which caused his brain to spill onto the roadway. The wife said she strongly believes that a vehicle hit her husband’s bike from the back, and the impact caused Dookhie to pitch off the bike and land on a stationary vehicle. 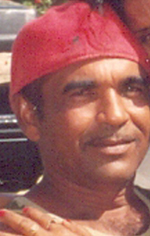 Last Thursday, Yudashram Dookhie of Lot 335 16th Street, La Parfaite Harmonie, West Bank Demerara was heading home when according to eyewitnesses, he collided with a truck. The father of two was riding a Jialing motorcycle when he slammed into the back of a truck that was awaiting the green light at the corner of Regent and Vlissengen Road. An eyewitness explained that the motorcyclist was heading north along Vlissengen road at a very fast rate when he slammed into the back of the truck. The impact caused the rider to be flung onto a motor car which was stationary at the time. Kaieteur News was told that the driver of the truck was not aware that the man had collided with his truck but was notified after persons, who were in the line waiting on the light, signaled him. At the scene, Dookhie’s helmet, brain matter and parts of the motorcycle littered the road. He was officially pronounced dead at the Georgetown Public Hospital Corporation.